Our great spring burns were very successful in top-killing brambles, and for the past several weeks we have been spraying all the resprouts. Many of the bramble patches have actually been sprayed twice, because not all the resprouts appear at the same time. Although the second pass is often quicker, in some cases it has taken even longer than the first. This depends upon how quickly the resprouts develop in a particular area. This is the ideal time to spray, as the new shoots arising from the bases of the canes, or from underground rhizomes, are small and require very little herbicide. This is the third year we have been spraying bramble resprouts, and unfortunately the extent of the work has not tapered off. Dealing with brambles in this way is expensive and time consuming, but we have hopes that we are getting on top of the problem. Even after two passes, there will still be some missed brambles. These we plan to deal with around mid-summer, when they will have grown into large leafy canes that should be easy to see. For these, we'll use triclopyr as a basal bark treatment. I think this is the best approach, since within a week after basal bark application their leaves should show visible damage. Unfortunately, our control of shrubs and brush is not finished, because now we are turning to buckthorn. 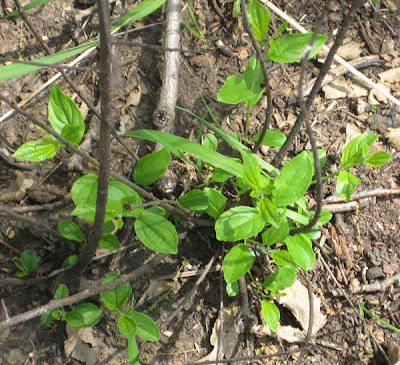 This shrub was also top-killed by the spring burns, but develops more slowly. Right now, the small resprouts are relatively easy to spray without causing any peripheral damage. The photo below is an example. Since we are using triclopyr, which only affects broadleaved plants, the occasional grass or other monocot nearby should not be affected. Fortunately, most of the areas we have been spraying are still free of herbicide-sensitive plants. This is the time of year when lots of prairie (and savanna) plants are just showing above ground. 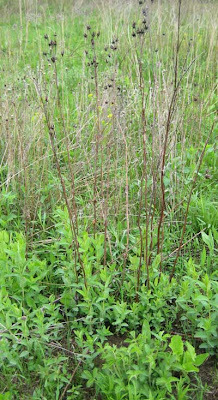 An important skill of the restoration ecologist is the identification of prairie plants at this stage, whether in a newly planted prairie or a well established site. How do you identify plants when they aren't flowering? After a few years of experience, you'll be amazed at how easy identifying some plants at the vegetative stage is. But how do you get that experience? The most secure way to identify a plant at this stage is to mark it with a flag and watch it periodically until it flowers. Take a few photos at the same time you mark the plant, so that you still have the image of the vegetative plant for comparison. (The early vegetative growth pattern of some species is quite different than that of the more mature plant.) Of course, this may take weeks (or months), which isn't very helpful if it's a weed and you need to pull it now. Another way, which works fairly well for a lot of species, is to look for last year's seed heads and then follow them back to the base. The photos here and the one above show an example for great St. John's wort (Hypericum pyramidatum). 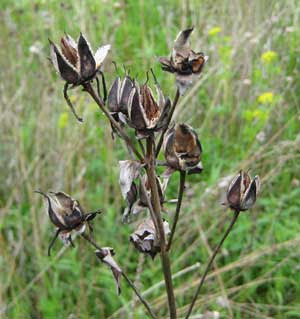 Its distinctive seed heads are easy to spot in the field. Once you find the seed heads, simply follow the stem down to the ground and there is this year's growth, green and lush. Lots of other species can also be spotted this way, such as stiff goldenrod, rosin weed, compass plant, prairie dock, pale purple coneflower, yellow coneflower, pale Indian plantain, etc. etc. The main problem with this technique is if the prairie has been burned, last year's seed heads may no longer be present, although a surprising number of species do retain their seed heads through a regular burn. Black Earth Rettenmund Prairie is one of southern Wisconsin's jewels, and I strongly recommend a visit in the next few days. Kathie and I manage this prairie for the Prairie Enthusiasts, and we make a special effort to monitor its phenology. Right now, wood betony (Pedicularis canadensis) is in its full glory, and all prairie enthusiasts will enjoy seeing this fascinating plant. Rarely will you have the opportunity to see such great floristic displays (see photo above). Wood betony is called a hemiparasite. This is because it is capable of parasitizing grasses (as well as some forbs) without actually killing them. 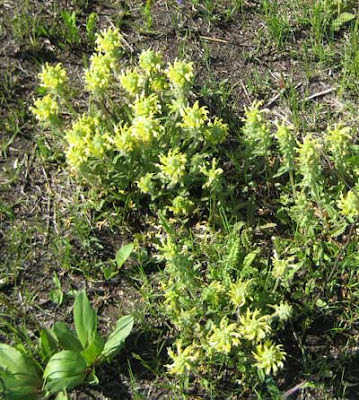 Wood betony's roots are capable of penetrating the host plant and transferring nutrients. 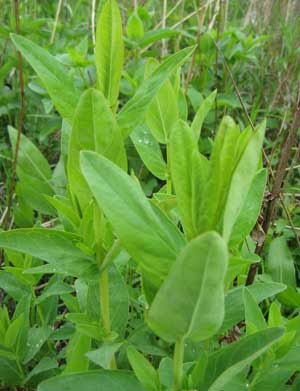 However, it remains a green plant, and is capable of photosynthesis. If you look at a wood betony colony carefully, you will notice that it is surrounded by a plant-free zone, although not far away normal plant growth occurs. Black Earth Rettenmund Prairie has an unusual amount of wood betony, and one idea for why it is such a forbs-rich site is that the grasses are held in check by hemiparasitism. Such a species has been called a "keystone species", since even thought it is a small plant it has a large ecological effect. There are places on Rettenmund where you can see this dynamics in action. Examine the grass density in a betony-rich zone and compare it with a betony-free zone nearby. The difference is striking. I saw one sharp line between a patch of needle grass (devoid of wood betony) and a patch of wood betony (devoid of needle grass). Interesting plant ecology! There are lots of other things to see at Rettenmund right now. The shooting star displays are phenomenal, especially in the south unit (worth a 15 minute walk). Other plants in full bloom include hoary puccoon, bird's foot and prairie violet, seneca snakeroot, false toadflax, and rock cress. Within a few days, the north side should be full of flowering downy phlox. There is always something happening. Shooting star (Dodecatheon meadia) is now in full flower all over southern Wisconsin. It is one of the great members of the early spring flora., with a C value of 7. During our restoration work, we have been able to observe shooting star development. It was native at Pleasant Valley Conservancy, primarily in savanna areas, and began to flourish as soon as we started clearing away the exotic invasive shrubs, especially honeysuckle. We now have rather large populations growing in areas of the East Basin where we removed honeysuckle two years ago. Since we had these native populations, we collected seeds to add to the mixes we used to plant prairies in our former ag fields. For some years after these prairies were planted, shooting star was absent, but at about the 7th growing season it started to show. 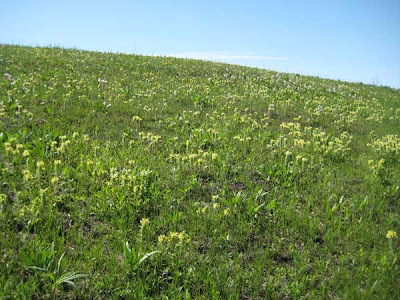 Currently, we have a lot of flowering plants scattered across Toby's, Valley, and the Pocket Prairies. Valley Prairie is now in its 7th growing season and this is the first year we have seen shooting star. These results agree with the research of Paul D. Sorensen (presented at the 12th North American Prairie Conference). A site with specatacular shooting star populations, is Schurch-Thomson Prairie, where a whole hillside of brush was removed about six years ago. Almost immediately, huge amounts of shooting star appeared and this plant should be at its peak right now. It seems that in these degraded areas, shooting star can remain alive in a suppressed (nonflowering) state under the shade of shrubs, but once sunlight comes in, it starts to thrive. How long can it remain dormant? The East Basin at Pleasant Valley Conservancy was a prairie remnant in the late 1930s but due to neglect by the late 1940s it had become wooded, and remained that way until we cleared it two years ago. Thus, shooting star can remain alive at least 60 years, perhaps longer. This agrees with observations that Rich Henderson has made (personal communication). Obviously, not all prairie species show this sort of tolerance. As described in a recent post, we are in an "all out" mode to eradicate brambles. However, this time of year lots of "good" plants are becoming well established, and we must ensure that they are not sprayed accidentally with the Garlon 3A. The unit I was working in today had lots of shooting star in flower. Also present were Jacob's ladder, golden Alexanders, tick trefoil, purple milkweed, carion flower, spikenard, whorled loosestrife, etc. Unfortunately, the bramble density was so high that resprouts were often growing close to good plants. Great care had to be taken to keep the herbicide off these plants. Since Garlon 3A affects all broadleafed plants, some damage may be inevitable. 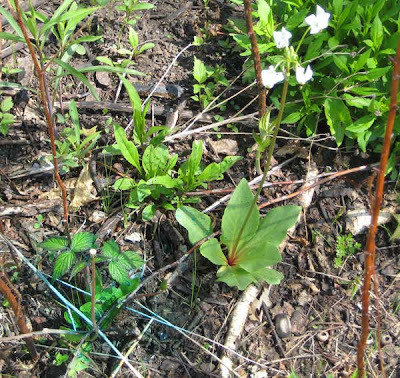 Shooting star is of special concern since the unit had lots of large plants, many flowering. 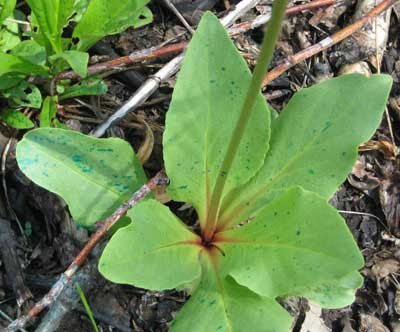 The photo below shows a sprayed bramble resprout (the blue dye is an indicator of spraying) right next to a shooting star plant in flower. What to do if the bramble and the shooting star plant are touching? I have two options. One would be not to spray the bramble, and try to control it later when it is more mature and the shooting star plant may have gone dormant. The other option is to spray very carefully so that only the bramble leaves are covered. I opted for the second alternative, but found that even with great care, it was virtually impossible to keep some herbicide off the shooting star leaves. The blue dye, which we use to control the spray pattern, tells the story (see photo at left). Even though the bramble resprout was six inches away from the shooting star, some herbicide droplets splashed onto its leaves. However, I am almost certain that these small droplets do not provide enough herbicide to damage the flowering plant. A bit of triage is necessary here. If we are going to eradicate the brambles, we have to be willing to live with a little damage to the good plants. Fortunately, in this unit there is lots of shooting star, so there is no danger of wiping out the whole population. We are in the midst of our major push on bramble control in our savanna areas. Because of our great spring burns, all the brambles were top killed but immediately begin to form new shoots. Most of these new shoots are from the bases of the old canes, although some arise from dormant shoots in the underground root systems. The date of the burn at each location essentially resets the clock. Thus, the brambles of areas burned earliest will be ready to deal with first. As in past years, we are spraying the resprouts with Garlon 3A, which works well. In order to ensure we don't miss any areas, I set up a detailed database using GPS. After all our burns were finished, I walked all the savanna areas, looking for major bramble patches. These were easy to spot, as the reddish canes can be seen from a distance. Each patch got a unique ID number and a GPS waypoint, as well as the bramble species (blackberry, red raspberry, black raspberry), the management unit, and notes on the extent of the patch. The data were mapped in ArcGIS and were also transferred to an Excel spreadsheet. In the spreadsheet I also had a field with a priority rating (1 through 6, with 6 being the largest). I ended up with 54 bramble patches, some relatively small and others quite large. Once all this was finished, I monitored the patches, looking for evidence that they had started to resprout. I expected those burned earliest to resprout first, and this was indeed the case. As soon as a patch had sprayable resprouts, we started treatment. At first this only involved Kathie and I, but soon Marci, Susan, and Heisley also participated. This past week, as things became critical, we all even worked on Sunday. The photo above shows us working in Unit 12A (which we called the White Oak Savanna), where there was a fairly large bramble patch mixed in with hazelnut. The dead canes are visible. Over the past week or so we have made great progress, although we still have many patches that have not been sprayed. So far we have concentrated on the larger clones. If time permits we will work on the smaller ones. Also, a single pass through these areas is not enough. The sprouts do not all develop simultaneously. Thus, we plan to return to these areas in a couple of weeks and spray any new sprouts (or those missed in the first pass). This is the second year of what will unfortunately be a long battle. However, we have had good success in earlier years. 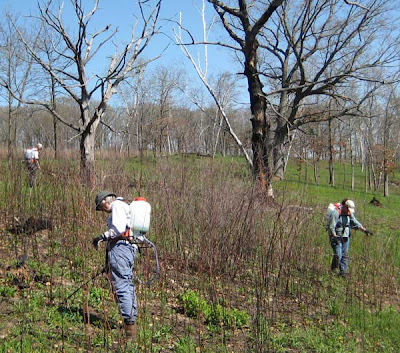 Last year, with partial support from a LIP grant from the Wisconsin DNR, we brought under control the brambles in several major areas of our ridge-top bur oak savannas. Hopefully, we will eventually suppress bramble growth in all of the savannas. Those whose experience is only with prairie restoration might wonder whether we are not being paranoid about brambles. However, brambles are much more of a problem in savannas than in prairies, especially savannas that have been restored. Once an area is opened up by clearing it of all the invasive trees and brush, brambles flourish. Research has shown that the bramble seed bank is very long lived, and with increased sunlight bramble growth begins. The first few years the infestation may not be too bad, but eventually it gets out of hand. All burning does is top-kill the plants. One reason why it is essential to burn oak savannas every year is to help check bramble growth. A year or two without a burn and the brambles dominate, making it difficult to carry a fire. Prairies might be burned on a two- or three-year cycle, but if possible savannas should be burned every year. 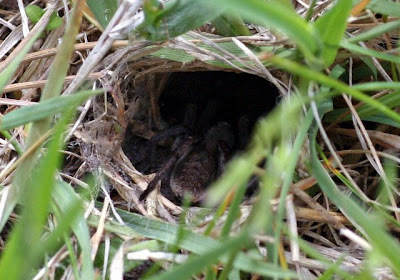 While she was spraying dandelions, Kathie discovered in the middle of our lawn, but quite near the Cabin Prairie, a small animal hole. A dark, somewhat vicious looking creature was crouched inside. Marci's research identified it as a burrowing wolf spider (Geolycosa sp.) (the photo here is hers). Although not rare, this is certainly an interesting creature, and one we have never seen before at Pleasant Valley Conservancy. According to the Audubon Society field guide to insects and spiders, the spider constructs a vertical burrow that is a few feet deep, with the walls cemented by silk. The spider seldom emerges but lies in wait for insects to pass by. I have a pair of Pentax Papillio close-focusing binoculars, which were perfect for studying this creature in situ. While I was watching, an ant passed the edge of the hole without being caught. Perhaps the spider was interested in larger prey. While we were watching, Kathie reached down to move a blade of grass. In an instant, the spider was down its hole. I thought about digging down to see how the hole was constructed, but decided it was probably better to leave the spider in peace. If you look carefully in the photo above, you will see one of the spider's feelers. 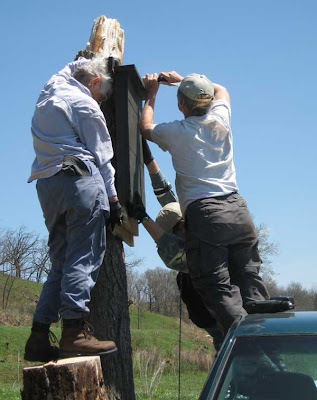 Madison Audubon is encouraging bat conservation and a group of us constructed about 25 bat houses for installation at various natural areas. Recently, Kathie, Susan, and Marci installed our bat house high on a dead stump. Bats prefer houses that are about 10 feet high and face south. Many people install a bat house on a tall pole, but this stump, the survivor of a violent wind storm, seemed suitable. Bats are extremely important members of the ecosystem, and play major roles in insect control. A single small brown bat can catch hundreds of mosquitoes and other insects per hour. Bats forage at night and sleep in the day time. The design of our bat house is one that has been approved by bat conservation groups. Now we must wait to see what happens.